Dr Zebib is a young postdoctoral fellow at UNISA via UNESCO-UNISA African chair in Nano-science and Nanotechnology, and iThemba LABS National Research Foundation of South Africa. She also has an international collaboration with Ohio state university – USA, University of Alberta – Canada, Katholic University Leuven-Belgium, University of Bologna- Italy and others. Dr Zebib is the first from Ethiopia to receive this award at a postdoctoral level. Dr Zebib has a clear view on what actions need to be undertaken in order to decrease environmental pollution and energy crisis in Africa. “I believe we need many more people engaged in science and scientific research in Africa in order to tackle the many challenges we face,” she explains. “We need science and innovation to break through poverty in a sustainable manner. And having better experience and exposure, I would be in a position to better influence the research that is done in Africa, contribute to capacity building, and help advocating better practices in using alternative renewable energy. She also mentioned that “my goal is to build a laboratory in Ethiopia, and contribute to my country’’. In 1998, L’Oréal and UNESCO initiated FOR WOMEN IN SCIENCE, an international program to recognize, encourage and promote women in science. It is inspired by two main goals: to honor established women researchers in all fields of Science, and to help young women researchers with promising research projects. The program consists of three levels; the L’Oréal-UNESCO Awards, awarded to five leading women researchers, one per continent, who are identified as role models; the L’Oréal-UNESCO International Fellowships, awarded to 15 young doctorate or post doctorate women to encourage international scientific cooperation and the development of cross-cultural networks and lastly, the L’Oréal National and Regional Fellowships which anchor the For Women in Science program in countries around the world. 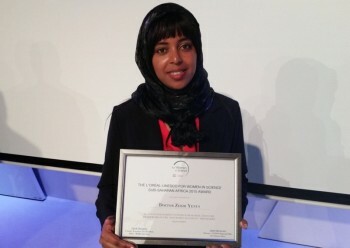 L’Oréal-UNESCO For Women in Science Sub-Saharan Africa 2015 program honors Africa’s female scientists, and one of the exceptional scientists from across Sub-Saharan Africa was Dr Zebib Yenus. Dr Zebib was awarded this prestigious award on Wednesday, 2 December 2015. This prestigious Award Ceremony took place on the evening of 2 December at The Venue in Melrose Arch, Johannesburg. She is among the three postdoctoral and other doctoral fellows who have been named as winners of the 2015 L’Oréal-UNESCO Regional Fellowships For Women in Science in Sub-Saharan Africa. Other winners include from South Africa, and Nigeria.